Varun Sivaram discusses his forthcoming book, Taming the Sun: Innovations to Harness Solar Energy and Power the Planet. Solar energy is the world’s cheapest and fastest-growing power source, but its rise is in danger of stalling. Varun Sivaram argues that realizing solar's potential will require innovation—creative financing, revolutionary technologies, and flexible energy systems. Well, welcome, one and all. Technically, good evening. I’m Richard Haass. This is the Council on Foreign Relations. Hopefully that’s where you mean to be. And today or tonight we are here to celebrate the publication of a book—let me hold it up—called Taming the Sun. For those of you who are parenting, that is S-U-N- not S-O-N. (Laughter.) Clearly Varun’s parents failed in the—in one of those two. And—it’s a family memoir. And the subtitle is Innovations to Harness Solar Energy and Power the Planet. And it is for sale. So those of you who want to stimulate this economy so it can grow, not just at 2.7 but 2.71 percent, this is your opportunity to do that. We’re also here, though, to celebrate the author, Varun Sivaram. And Varun is the Philip Reed senior fellow—or, fellow, rather, here at the—for science and technology, here at the Council on Foreign Relations. He also has 26 other jobs—(laughter)—including being an adjunct professor at the Georgetown School of Foreign Service. He’s also connected with Columbia University and its center for global energy policy. And he advises all sorts of places in the—in the energy world. And he’s on all sorts of lists as the most talented young people, which is—the entire idea I find increasingly offensive. (Laughter.) But we’ll do the event—we’ll do the event regardless. What we are going to do is talk for a few minutes, he and I. And then we are going to open it up to you all to grill him about this book. So before, though, we start the grilling, I want to give you the right of every author—besides, first of all, congratulations on this. SIVARAM: Thank you, Dr. Haass. HAASS: Congratulations. Is—I know you’ve got some family, you’ve got some friends, you’ve got some fans. So why don’t you just take a second, and this is your Academy Award moment, to thank them. And then we’ll get on with the other business at hand. SIVARAM: Well, thank you, Dr. Haass. I’d love to start by singling out the gentleman here on the left. Michael Levy was the person who brought me here to the Council and was the inspiration behind the book. Thank you, Michael. I also would love to single out—I think I see Evan Michelson over there, who has supported the project. Thanks so much for the generous support of the Sloan Foundation. As well I saw Jane somewhere here. Jane Flegal from the Spitzer Trust. I’m really, really grateful for your support. SIVARAM: My parents flew from California. They’re over there. My two sisters also flew from California. My girlfriend, Lutchebe (ph), came on the train from D.C. And finally, I’m so grateful to the Council. Everybody at the Council from, for example, Lisa Shields at communication, Sam Tartas. Jim Lindsay is somewhere here. There is Jim. Shannon O’Neil. HAASS: Oh, yeah. (Laughs.) And we want to start on page 283, and—(laughter)—OK. So two questions to begin with. What led you to write this book? And what led you to name it thus? SIVARAM: I’ve been in the solar industry now for over a decade. My first job was at a startup in solar. It happened to go bankrupt, but at the time we were—we were developing a really innovative technology. After that, I’ve worked as a scientist, in an academic lab. I’ve worked as a policymaker and I’ve worked in the private sector. And in each of these cases, there are these different perspectives on what solar’s future should be. Oftentimes, they’re conflicting. I wrote the book to try and sift—or to try and tread a path that takes the best from all of these conflicting perspectives. So to give you a couple examples, folks on the left will say that solar just needs subsidies, we should continue to support it, and it will achieve what we want it to. Folks on the right say that solar is a boondoggle and we really should not spend any more money on it. The answer is somewhere in between. Similarly, folks in science will say the revolutionary new technology is all we need, whereas folks in finance will say that we already have the technology we need, it’s bankable already. Again, the answer is somewhere in between. I hoped to give folks who didn’t have much exposure to the industry, as well as folks in one sector, a glimpse of all these different perspectives, and provide a single account of what solar’s going to need, because it’s come a long way, but I think it’s got much more to go. HAASS: OK. So for those of us who are not solar experts, give us a little bit of a foundation here, Varun. Which is, right now, what’s the baseline? How important is solar energy now in this country and more broadly around the world? HAASS: In that case, the meeting’s over. (Laughter.) Sorry. SIVARAM: So, today, solar energy accounts for a little more than 1 percent of the United States’ electricity consumption, about 2 percent globally. So it’s not that important. On the other hand, solar energy is, as of last year, the cheapest form of electricity in many parts of the world, and the fastest growing. It raised $160 billion last year in investment, more than any other power source clean or dirty. So it’s clearly growing rapidly. And I believe that solar is our most promising tool if we’re going to combat climate change and if we’re going to transition to clean energy, because the sun is by far our most abundant source of power. Every hour more energy comes from the sun than the world uses in a whole year. So I think that there is vast potential, it’s finally got some momentum and is growing. But to be perfectly honest, it’s not that important right now, contrary to what you may read in headlines. HAASS: So give a sense then, a realistic possibility, in five years, 10 years, in a generation, in 20 years, how important could it be. If people did, we’ll come back to what you think are the right things in a minute, but what’s the upward band in those various times? If we basically got the—if you could dictate public policy, where could solar be? SIVARAM: If I could dictate public policy—I’ll start at the long end of that horizon. By 2050, I want solar energy to supply a third of global electricity. That’s a big deal, because the total electricity supply is going to grow by two times. So solar is going to have to grow by something like 30 times between now and 2050. Now, I don’t think that’s realistic given today’s policies and the path we’re on. I do think it’s realistic if we invest in innovation. And I argue that there are three kinds of innovation. And kind of everybody from the private sector or the public sector, academia, everyone’s got a role to play in achieving this 33 percent target, which is a prerequisite if we’re going to transition to clean energy and decarbonize our economy and avert catastrophic climate change. HAASS: Before I ask you what needs to happen, what do the—just so I understand solar’s advantages over other forms of energy, what are its advantages? What are its disadvantages? SIVARAM: I’ll start with disadvantages because I never answered you question, why did I call it Taming the Sun? SIVARAM: Why does the sun need taming? It is super, super inconvenient. You know, we have a lot of convenient stores of energy. A barrel of oil is easily portable. It’s highly energy dense. Sometimes it’s found in geopolitically fraught areas. Maybe I got the causality backwards. But it’s super convenient in general. Solar, by contrast, hides behind the clouds in some areas. It scorches the terrain in other areas. It’s generally diffuse. So we need to tame it. And in order to do that, we’ll need human ingenuity. That’s my argument. Now, the advantage is that solar energy is by far the most abundant energy source compared with any other energy source. In fact, all of our energy sources originate in way one way or another from the sun. The only ones that don’t are nuclear energy and geothermal energy. But wind energy comes from the sun. Our fossil fuels, after millions of years of decomposition and, before that, photosynthesis, that also came from the sun. The sun is the route of all of our energy. And our best hope of a clean energy transition is by relying on the sun. So those are—those are some of the advantages. HAASS: OK. So the answer it’s quite modest now in what it does, but tremendous potential. OK, so I assume the reason, in part, you wrote this book is this potential is not inevitable. There’s very little in life that’s baked into the cake, that’s inevitable. So what are the two or three things most important that need to happen if the story’s going to have a happy ending? SIVARAM: Yeah, because this story will not have a happy ending on current course and speed. I think there are three things that have got to happen, and only one of them is, like, generally on track. The three things that have got to happen are financial innovation, technological innovation, and systemic or systems-level innovation. The first one, financial innovation is, for solar to continue its hockey stick-like trajectory, it’s going to need way more money, way more investment capital than it currently can get from its current investors. It’s going to require trillions of dollars. And today’s investors in solar don’t have that kind of money. HAASS: Can I just interrupt you for a second? HAASS: Why? Why is it—what’s the rationale for that kind of a ramp up? HAASS: No, I’m actually asking you why it would take so much investment to get there? What it is it about solar that you need such an—because you said the current resources are pretty considerable. Why you need whatever the multiple is. What’s it about where solar is and where you think it needs to get to that demands such an increase in investment? SIVARAM: You know, solar is particularly capital intensive. You put all your money in up front. You build the solar installation. And then it sits there, and it produces power for 20, 30 years. So the cost is borne in producing and installing those solar panels up front. In contrast, for example, to other—a fossil fuel powered plant, where not only do you build the plant, but you pay for fuel over the lifetime of the plant. In solar, all of your costs are front loaded. And so it’s going to take a tremendous amount of capital to ramp up the amount of solar that we have installed by 30 times. And that level of capital starts with a T, trillions. And the only folks who have the trillions available to deploy in this asset class as your institutional investors. They actually have way more than enough. And it would be fairly straightforward for them to invest in solar projects if they were easy to invest in. And I think that they aren’t right now. You know, an institutional investor cannot invest in a solar project the same way he can buy and sell stocks and bonds on public capital markets. And I think that financial innovation that makes it easier for investors to do that—I think that is—that’s actually happening and it’s going to happen even more in the future. I think that’s going to make it possible to source those trillions of dollars and get over solar’s first speed bump, which is a scarcity of capital. HAASS: Before we go to points two and three, what’s the nature of the financial innovation that is either happening or needs to happen, so I can go and invest in solar in a way that would make a difference? SIVARAM: I think solar’s got to learn from other industries that do this pretty well. So, you know, you can learn from the oil and gas industry that funds it pipelines through a vehicle called the master limited partnership. That’s a—it’s a publicly traded stock. Similarly, solar companies or solar vehicles could pool a project—a portfolio of projects together and list it on a public stock market. Similarly, the solar industry could learn from the auto or mortgage industries and use securitization. Now, that does provoke fears. We had some issues with securitization and mortgages. But there are safe and responsible ways to do this, to securitize, for example, distributed or rooftop solar assets, put them together in a pool or bundle, slice them up, and sell them on public capital markets, and source a whole lot of capital from institutional investors. HAASS: OK. So you said there were three things. There was financial innovation, there was, what, technological innovation, and systemic innovation? I was listening to you. (Laughter.) Why don’t we go through the other two then? SIVARAM: Sure. You know, I believe that even if solar gets over that first speed bump, financial innovation, we get over that, the bigger wall it might run into is when you have a whole lot of solar energy and that tends to undercut or cannibalize its own value. See, right now solar is very valuable around the world because there’s very little of it. When you have a lot of solar, that solar only produces power right in the middle of the day, which is inconvenient. It’s kind of a nuisance. And if you have a ton of power in the middle of the day and not a whole lot in the evening time, that—the next solar panel, the marginal addition, is no longer very useful or valuable to a power grid. So very quickly the economics can be pulled out from under solar. It’s a victim of its own success. To prevent that, I think two things need to happen. Solar needs to get cheaper a whole lot faster, so its cost stays below the value that it delivers. And solar’s value needs to fall less quickly. The first, making it get cheaper faster, is technological innovation. And the second, making its value fall less slowly, is systemic innovation. So we’ll talk about technological innovation. I think there are remarkable new technologies to convert sunlight into electricity—I’ve worked on some of them in Oxford, for example—that could be more efficient than today’s technology. Silicon solar panels, 90 percent of the market. They could be cheaper. And they could be flexible, colorful, semitransparent. They could look like coatings. You could print them out of an inkjet printer. These technologies are remarkable, but currently they’re confined to laboratories and very small-scale demonstrations. I think it’ll take substantial investments from the public and private sectors to scale them up. On the systems side, how do we make sure that solar energy, which is often very inconvenient. It comes right at lunchtime when you may need it at dinnertime. How do you make sure that that’s not worthless or valueless power? Well, your system has to be able to flexibly adapt to when the power’s being generated so you can use it no matter when it’s produced or how much if fluctuates. HAASS: Is that a storage and grid problem? SIVARAM: Exactly. I think there are many different ways to buffer this intermittency. Storage is one of them. Lithium ion batteries are getting cheaper. That’s one part of the solution. There are other energy storage solutions, like pumped hydro storage. You can also make your grid bigger. If you grid is larger, it can aggregate together volatile supply and demand, and smooth it out. Your grid can be smarter. Customers can ramp up and down their consumption of electricity with their appliances, right? Your water heaters, your thermostats. If they’re networked together and intelligently use or don’t use electricity when it’s available, well, that can use solar energy more productively. There’s a whole host of solutions. HAASS: And where is the research and the development going on? Is it here? Is it China? Is it in a country that gets a lot of sun? What’s the center of the solar future? SIVARAM: You know, we get a lot sun. We should be doing a whole lot of solar research. And for decades, we were the center of solar research. HAASS: We, being the United States. SIVARAM: (Laughs.) It’s going to pass all other concerned parties. And that’s worrying, because China dominates the industry today with existing technology. 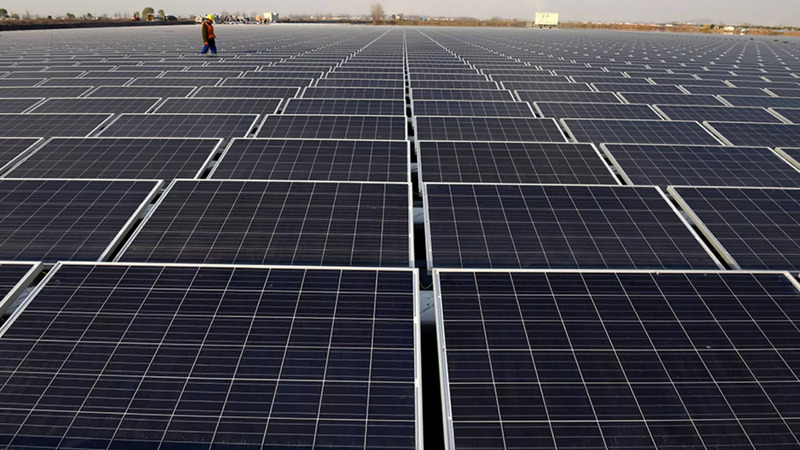 It would be a shame if China continues to dominate the production of new solar technologies. HAASS: Now, when China’s doing all this investing it’s obviously coming from the government. What’s the situation here? Given, you know, the recent budget and so forth, what is this administration and Congress doing on solar? What’s the private sector doing? Explain for us a little bit the situation. SIVARAM: So, you know, I would hesitate to say this administration and Congress what are they doing, and put them in one breath, because actually, as it turns out, they’re doing two very different things. This administration put out a budget request that said let us slash investment in renewable energy by two thirds, in research and development. Congress, fortunately, came out with its spending bill that was just signed by President Trump last weekend, saying: Let us increase investment in energy innovation. All solar technologies will get a 15 percent bump. Solar photovoltaics, which convert sunlight into electricity, that gets a 33 percent bump. So that’s actually an excellent development from the standpoint of the United States leading on energy innovation. Not coming from the administration, but it thankfully is coming from Congress. And it’s coming from congressional Republicans like Senator Lamar Alexander, is one of the leaders on advocating for energy innovation. HAASS: Tennessee gets a lot of sun? HAASS: Yeah. (Laughter.) Is there anything else that can be done in the way of regulatory policy, public policy, to encourage either greater state/local or also, obviously, private sector investment? SIVARAM: Yeah, absolutely. Like I said, the federal government’s role—or, government in general, they role of public policy is to support, in my opinion, technological and systemic innovation. I’m quite confident about financial innovation. On the technology side, you know, ramping up funding at the federal level for energy innovation is necessary but insufficient. You’ve got to do it in a way that emboldens the private sector to invest, because if private investors are not co-investing the federal government alone is probably going to be unable to get these innovations out of the lab. On the systemic innovation side, I think the federal government, for example, can play a more muscular role in permitting long-distance transmission lines. We’ve done a bad job of building these lines. China’s doing it way better than we are. They have, I think, you know, 13 times as many long-distance, high-voltage direct current transmission lines than we do. And, you know, the federal government can play a role. States also have an important role to play because this is an area where many states have veto power over transmission lines. And they’ve held them up. In addition, I think states have an important role to play in the regulation of power utilities, to make sure that those utilities support the development of a smarter grid, a grid that enables you, and me, and all of our neighbors to network our appliances together and respond intelligently with our demand to the available solar supply. Because without that responsive customer demand and that smart grid that enables it, we’re not going to be able to integrate a whole lot of solar power. HAASS: Well, in the past the federal government has tilted the playing field is many ways in energy, either through tax breaks, investments, subsidies, what have you. So has solar basically been a beneficiary or has it suffered because of government policy? And going forward, is one of your arguments that the playing field ought to be tilted, say, away from nuclear and toward solar, away from fossil fuels and towards solar? I mean, what is almost the macro argument you would have about public policy? SIVARAM: You know, I think that the regime of public policy that’s gotten us to where we are today has to be different from the regime going forward. Because getting to where we are today, which is the solar industry turning from this cottage industry into a powerhouse, that took the federal government tilting the playing field, in some ways, towards solar. For example, by providing subsidies for solar through an investment tax credit. That’s not to say they don’t subsidize other industries. The oil and gas industry receives its own set of tax preferences, $4 billion a year. But to date, that’s what it’s taken to get solar to where it is. And this has happened in the United States and it’s happened in countries around the world. Going forward, though, I actually don’t think that the playing field needs to be tilted toward today’s solar technology, which is, frankly, a pretty mature technology. For example, that subsidy—the investment tax credit-isn’t going to be needed for very much longer. It’s scheduled to sunset. And my preference is for it to sunset. Going forward, the kinds of public policy support that’s needed is more support for innovation, support for emerging technologies, and support for these more flexible systems that integrate solar, rather than the direct subsidies and the direct mandates for solar that have historically characterized the policy to date. HAASS: Just out of curiosity, have the other forms—have industries or businesses that are involved in other forms of energy, are they trying to slow down what you want because they see solar as a dangerous competitor? SIVARAM: I don’t think so yet. I don’t think that, for example, oil and gas majors are involved in materially slowing down, you know, the pace of solar growth, just because solar is this tiny competitor in comparison. SIVARAM: Absolutely. It could absolutely change. It already—you know, we saw demand for turbines from General Electric and Siemens has fallen and they’ve been forced to do a lot of layoffs. I can certainly see going forward that companies involved in the fossil fuel business might be threatened by the rise of renewable energy that, you know, increasingly is not the fringe competitor, but can start to compete with mainstream sources as a mainstream contender. HAASS: I’ve got two last questions and then I’m going to open it up. One form of public policy that this administration has championed—which you haven’t mentioned tonight even though you’ve written about it—is tariffs. And when you wrote about it, your enthusiasm for that instrument of public policy was, shall I say, finite. (Laughter.) So your take on it was that what was ostensibly done in the name of helping the American solar industry actually did not. Fair enough? SIVARAM: I completely agree with that statement. SIVARAM: I think that President Trump’s solar tariffs were this remarkable policy that benefitted almost nobody. (Laughter.) You know, in the United States—well, let me back up and give you a little bit of history. The United States used to be a significant manufacturer of solar panels. As recently as 2005, I think the United States accounted for 25 percent of global production. A decade later, it accounted for less than 5 percent of global production. The culprit was the confluence of the financial crisis and the rise of Chinese supplies of silicon solar panels. And the Chinese happened—no, not happened to—the Chinese did export below-cost solar panels thanks to generous state aid for their producers. HAASS: And the guys who install the panels. HAASS: OK. I’ll hold off further questions because I want to get you all involved. So just raise your hand, let us know who you are, wait for the microphone. Stephen, why don’t you go first? Let me go back to the line of questioning Richard pushed you on, on public policy. It seems to me you’re a little optimistic. The existing energy system is pretty efficient—emissions notwithstanding. The problem, of course, is in delivery. But that would be the same thing for you—for solar as well. As you move to a very large share of the energy need being taken over by solar, a lot of those—a lot of that’s going to have to be gotten rid of, have to be taken offline. I can’t imagine—especially now when the funding for this is so upfront—I can’t imagine that’s going to be easy, or even that a normal market are going to play—would deal with this. Are you really sure that elaborate public policy is not going to be necessary to move solar from a relatively small share to a significant share? And what do you do about the incumbent competitors? How does all that play out, in your view? SIVARAM: I absolutely believe that, you know, elaborate public policy is going to be needed to increase solar from its small share today to a large share. I do believe that right now solar is quite competitive in our existing market structures. You know, solar—the way our power markets work, you know, generators bid based on what their marginal cost of production is. Solar’s marginal cost is zero. So solar actually does very well in comparison with other plants, be they coal plants, or nuclear plants, or even natural gas plants. I don’t really see a problem for solar to continue growing now when it’s 1 percent or 2 percent of the mix. Down the road, though, solar is going to deliver far less value when you have a ton of solar, when you have greater than 10 percent solar. In California, for example, you have a greater than 10 percent share of solar in your electricity mix. And for years, solar had been protected by mandates in California. California had a particular percentage of its state energy needs that had to be met by solar. And so solar kept growing. Between 2018 and 2020, that mandate has already been met. And so it’s no longer constraining. The pace of solar deployment has stalled. And the reason is that the underlying economics no longer make sense for solar. That’s why I believe that we will need considerable public policy to help solar continue growing. I just don’t think that public policy is going to be in the form of direct payments or even mandates. I think the right way to do this is to make your energy system so flexible that increasing that marginal addition of solar still makes economic sense. Now, there’s a political economy point that you made, which is these incumbents are going to have to go offline as a result. You’re going to displace somebody, and it’s probably going to be coal and then increasingly natural gas down the line. What do you do about that political economy constraint when those generators are lobbying your government to change market structures? And you see it happen. This government—they’re currently in their second attempt to try and bias the market against renewables. We’ll see. I expect the renewable energy industry to become more powerful politically. I expect there to be a political battle. And I’m not sure either of the policies of the renewable energy industry or the policies of the fossil fuel industry will be the correct ones. The correct ones will be the ones that achieve decarbonization at the lowest cost. HAASS: Speaking of carbon, I would assume that one of the things that would accelerate what you want would be a carbon tax. Everyone who’s in the business of producing solar would be out there championing that, because that would, for obvious reasons, be an example of public policy that would benefit solar big time. SIVARAM: I do believe in pricing carbon. I think it’s super important. I don’t believe it’s a panacea. I think that folks—you know, there was a recent proposal from some prominent Republicans, for example, Secretary George Shultz, suggested that, hey, let’s get rid of all environmental regulations. Let’s replace it with a carbon tax. Let’s return the carbon tax’s dividends as a—you know, as a tax break to the middle class, and everyone goes home happy. Unfortunately, I think that a carbon price is a necessary but insufficient condition for averting climate change. That you have to have a carbon price, but you also have to have support for innovation in the form of research, development, and demonstration. These two conditions need to be met because there are twin market failures to solve, not just the market failure of mispricing carbon. HAASS: Sir, in the back. Q: Hi. Reid Capalino, Aligned Intermediary. So, Varun, you are now in charge of the U.S. government’s solar R&D portfolio. What are your priorities? And what changes, if any, would you make to existing programs? SIVARAM: Reid, I’m so glad you asked that question. (Laughter.) Because I only got to talk about one of my favorite technologies, which is perovskite photovoltaics. You know, there are a whole lot of other photovoltaic technologies. And I think the Department of Energy should be funding a portfolio of them. These are cool names like quantum dots and organic solar cells. But in addition to photovoltaics, which convert sunlight instantaneously into electricity, there are other buckets that actually come with built-in storage of energy. See, storage is a big problem since the sun is so intermittent. You know, one of those technologies ins concentrated solar power. This is where you use mirrors to focus the sun’s rays and generate heat. You can store that heat and you can generate electricity with a steam turbine 24/7. And there are research and development priorities for that technology. HAASS: Sir. Would you introduce yourself? Q: Yeah. Paul Richards from Columbia University. So I appreciate your presentation. It’s wonderful. I’m with you. But I’d appreciate your comparing and contrasting solar with wind, which has the benefit of working at night and, at high latitudes, in the winter. SIVARAM: I think that solar and wind are complementary sources of energy. And I mentioned earlier on that by 2050 I hope that solar will account for a third of the global power mix. I hope that by 2050 solar and wind collectively account for a majority of the global power mix. They’re our two most important clean power sources going forward. In many cases, solar and wind are what’s known as anti-correlated. When the sun is not shining, the wind is blowing even harder. And if you have a portfolio of solar and wind, aggregated over a large area, you can mitigate a lot of the intermittency issues that you have. That said, solar and wind alone are not our solution. And, you know, there has recently been, you know, a fair amount of press about solutions on wind, water, and solar. Can we just power everything with those three sources of renewable energy? It’s probably not the case that we can do it. You know, it’s going to be pretty hard to get to 60 percent. We can—renewable energy. We can do it with long distance transmission lines. But we are probably still going to need other sources that include nuclear energy, for example. We’re probably not going to be able to move entirely off of fossil fuels. So we better finds ways to capture and store carbon emissions from fossil fuel combustion. So I think we’re going to need a whole portfolio of resources. But I like to call solar the star of the energy revolution. (Laughter.) And I think it should have a strong supporting case. HAASS: Varun’s next appearance will be in the Catskills at—(laughter)—this is a try out. He’s kind of working on his solar puns, or—(laughter)—sir. Q: John Sakowicz, KMEC radio and NPR. Saudi Arabia is now planning for a 500-megawatt plant. This is at least an order of magnitude bigger than anything that’s ever been even contemplated in the past. Of course, Of course, natural gas is cheap in that part of the world as well. Do you have any special insights into their decision-making process to go to forward with solar? Thank you. SIVARAM: And, sorry, I actually don’t mean to be snarky, but the number is actually a factor of 400 larger. Saudi Arabia wants to make a 200-gigawatt plant. It would be the largest in the world by a factor of 100. To give you a sense of perspective, Saudi Arabia wants to install twice as much solar in Saudi Arabia than was installed around the whole world last year. And that will be through a joint venture between Saudi Arabia and SoftBank, led by Masayoshi Son. The first thing I’ll say is that my favorite tweet about this was from a solar analyst who said: I have made coffee dates that are more binding commitments than this MOU. (Laughter.) So we don’t actually know if this thing’s going to happen. That said, there is—there is a strong reason for Saudi Arabia to do this. You know, Mohammad bin Salman’s Vision 2030 says that Saudi Arabia needs to diversity its economy. In addition to diversifying its economy, it wants to make some money off its oil. And the way to do that is to stop burning it at home to provide subsidized electricity. You export it abroad and you use solar to produce electricity at home. The installation you’re talking about, sir, would produce 100 percent of Saudi Arabia’s electricity, although for it to do that Saudi’s going to have to have a super beefed up grid, exports to neighbors, a lot of storage, et cetera, et cetera. So I don’t actually know if that whole thing will happen. I’m most interested in the first tranche, which is going to be a seven-gigawatt tranche. Let’s see if that gets built which, by itself, would be a remarkable accomplishment. I also think Saudi Arabia is an ideal place for them to test this out. There’s cheap capital, a lot of sun, and a government that’s committed to this. I think it could be a remarkable growth market. HAASS: So what about solar not in places where you have high population densities, like cities, where you need to think about scale, but in areas of low population density? The idea of what, I guess the word is distributed or localized solar. What about its potential there? SIVARAM: One of the remarkable things about solar is its versatility. Unlike other kinds of power plants, you can have one solar panel powering, for example, a rural African villager’s home—and this, actually, is happening increasingly—or you can have, you know, a farm of millions of solar panels, like the gentleman just mentioned, a 200-gigawatt installation out in the Saudi Arabian desert. So it can do many, many things for many, many people. I think that the future mix of solar deployment will be a mix of distributed and centralized. For example, solar will have applications in remote areas. It will have applications in islands. In Puerto Rico, we’re going to see—hopefully—solar-powered microgrids that help to rebuild a grid that was horribly vulnerable to the kind of natural disaster that struck Puerto Rico. And we’re also going to see, I think, large solar installations, both photovoltaic and the other thing I mentioned, the mirror that concentrate solar energy, concentrated solar power, out in areas of the desert. There’s a large plan for a Sahara Desert concentrated solar power installation to help to serve some of Europe’s power needs. SIVARAM: As opposed to sunspot. A sweet spot of solar in between centralized and decentralized that can serve hundreds or thousands of homes in a community or a full military base, that sort of thing. HAASS: We’ve got time for a few more. Sir. And wait for a microphone, if you would. It’s coming right up. There you go. Q: Thanks. Ken Kramer, Rushton Atlantic. This is a fast-moving sector. Varun, what’s the most important or most interesting thing you’ve learned since you finished the first draft of the book? Or, alternatively, did your research take you in any directions that you were not expecting when you started this project? SIVARAM: I will say—so, Ken, you know, read the first draft and offered really helpful comments from the financial innovation point of view. Ken, I will say the thing that kept surprising me was every quarter, you know, I’d finish one or two chapters and I’d find out that the cost of solar has plunged below the last quarter’s forecast, or the cost of storage has fallen faster than I expected. And so by the time I was done with that first draft, I decided that it wasn’t 100 percent certain that solar was going to hit this wall. In fact, it may very well be the case that today’s technology, following its historic cost declines, might in fact not hit that wall. I just think that there’s a large chance that it does hit that wall. In fact, I’m relatively certain it will even with the recent declines. And so that’s why I softened some of the language to say there is uncertainty, there is risk. And to deal with risk the best way is to proactively invest in different possible scenarios of the future. And I can’t think of a better way to do that than to invest in innovation. These investments in innovation are pretty capital light. They’re, you know, single digit billions of dollars, rounding errors on the federal budget. Can afford this stuff. And so even if it’s the case that today’s technology takes us where we need to go—I don’t think it will, but it may—33 percent by 2050, we will not have done anything regrettable by investing in a portfolio of new and revolutionary technologies. HAASS: Why is that the goal of government? Because governments don’t do well when investments don’t pan out. Congressional committees hold hearings. Why is that not the place more of the private sector? SIVARAM: No, it’s got to be the place of both. But it is a very well-established market failure in the economic literature, the fact that private firms do not invest in innovation to a societally optimal level because of something known as the non-appropriability of knowledge. If you invent something, the fruits of your labor often are shared among society and you don’t get all those fruits yourself. Hence, there is an important goal for public policymakers to plug that gap, to invest to the point where private sector entities are emboldened to put in their own capital. I think that the private sector has got to invest the majority of the capital needed to bring these technologies to commercialization. But without that push from the public sector, I think that they will—you know, companies will languish in the valley of death. And unfortunately, the private sector won’t have the capital to get them to the finish line. Q: Pat Rosenfield, Rockefeller Archive Center. But my question follows just on that point, and it’s about the public. I’m—not the public sector, but the public. So you’ve talked about financial, technological, and systemic. But I—implicit in the whole discussion is the role of the consumer and the individual and the public. Could you talk a little bit more on your perspective, not just related to price, and not just left or right, but really where the consumer is in all of this? The article in today’s New York Times made it seem as though Arizona consumers, consumption of energy from the individual’s point of view, was very much pro-solar. But where are we with the consumers, both in this this country and around the world? SIVARAM: Yeah, this is—this is a question I really struggle with. What’s the role of personal responsibility, of the way that all of us choose to live our lifestyles? Is it each of our responsibilities to live in a much more sustainable fashion? If so, I really should stop flying because the effect of flying swamps my carbon footprint from all my other activities. I’m not convinced that the answer to climate change lies in personal responsibility, because if we relied in individuals to make, you know, sustainable choices, restrict their consumption, for example, in aggregate, you know, we may never get to the levels, for example, of emission reduction that we need to. Certainly, there is a role for personal sustainability, but I think that the system level it’s really important to shape the incentives so that individuals don’t have to make the tough choices. In the domain of solar in particular, I fear that the emphasis on individuals trying to live a sustainable lifestyle, an individual putting a solar panel on his roof or an individual saying that, you know, my consumption is going to be net zero, because I’ve got solar, I’ve got a Tesla Powerwall, I don’t use any energy from the grid. That turns out to be a societally inefficient, cost ineffective way to decarbonize our electric power system. And so if every individual tries to solve this problem on its own, the sum will, unfortunately, be less than the sum of its parts, if that makes sense. So I believe much more in the power of public policy to shape at the systems level what resources we use. We use some large-scale resources and some decentralized resources. And we do it in the most cost-effective way. HAASS: We have time for one last quick question before the sun sets on this meeting. (Laughter.) Yes, ma’am. HAASS: You have to wait for the microphone. Q: Masuda Sultan, Insight Group. Do you think that battery costs could come down 75-80 percent in the next seven or eight years in the same way that panel costs have come down? And if that happens, what are the implications? And do you think a grid would even be necessary? SIVARAM: I’m thrilled you asked that question. I’ll first say Figure 9.4 addresses this exact question. (Laughter.) And the question is, look, what if we had super cheap batteries, right? Wouldn’t we just be able to pair every solar panel with a super cheap battery? We wouldn’t really need a grid because your solar panel just turned into the most reliable generator ever, because it’s got a battery. And so what I and my colleagues at MIT did is we simulated a power grid, the Texas power grid. And we said, all right, let’s assume we have super, super cheap batteries. It sounds like you’re in the market, so we used $150 per kilowatt hour, fully installed for the battery system. We used 25 cents per watt for the fully installed solar PV cost. And we found that a majority of the electricity under a cost-optimal generation mix turned out not to be from solar. We actually had a significant component still coming from natural gas. So it turns out even with substantial cost reductions in batteries, the grid is still pretty useful. And other kinds of generators that are very flexible are still pretty useful. Because it turns out batteries are not only pretty expensive, but they also aren’t great for storing energy beyond just a few hours. They’re not great for storing energy over days, weeks, months, seasons that solar is intermittent over. So I think—because I’m one pun behind Richard right now—(laughter)—so I think that, you know, there are a whole battery of solutions. (Laughter.) And the battery is only one of them. HAASS: OK. This is now going to be difficult. (Laughter.) As you can tell, you’ve got a real authority who actually brings to this a rare combination of the science and the public policy, which is what it takes. But don’t just take my word for it. The Economist described the book as offering a sobering message that may be as prescient and as readable as Robert Shiller’s Irrational Exuberance was before the dot-com and housing crises, and the FT said that this book is both the best available overview of where the industry finds itself today and a road map for how it can reach that brighter future. HAASS: No problem. You did well, mom and dad.